He died nearly 800 years ago, and yet we all still know his name. 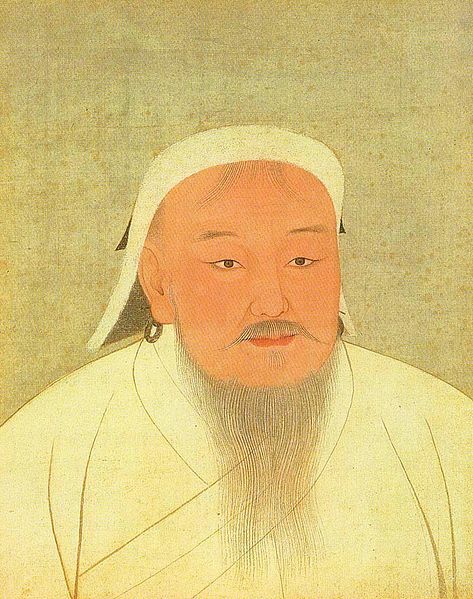 From 1190 to 1227, Genghis Khan ruled an empire that eventually stretched from Russia to China. He is responsible for millions of deaths, but he also unified warring factions and brought peace and security to 5000 miles of trade routes. The complicated legacy of his Mongol conquest spans the globe and continues to be felt today. Genghis Khan was born to the head of a Mongol clan in the mid-12th century near Ulaanbaatar. He was the third of five sons. After his father died, he and his brothers were too young to succeed him, so his family was discarded and, therefore, lived in poverty for several years. At about the age of 10, he is rumored to have murdered his older half-brother, with whom he frequently quarreled, by shooting him with a bow and arrow. According to researchers at the University of Southern California, this brutal act secured his eventual succession to his father’s position. Genghis became king of the Mongols in 1190 and unified them with the Tatar tribes in 1206. He conquered the Xia and Jin Dynasties in China in 1210 and 1215, respectively. He later brutally invaded the Persian empire of Khwarezmia from 1219-1221. After his death in 1227, his sons continued to conquest and took Korea in 1231. In 1241, they invaded Poland, Transylvania and Hungary. At the height of their power, the Mongol Empire stretched from Russia, down through Turkey and Iran and all the way across China and Korea to the Pacific Ocean. You don’t conquer Asia without cracking a few skulls. In fact, during their horrific invasion of the Khwarezmia Empire, it is rumored that after taking Samarkand, Genghis ordered the civilians, including the children, beheaded and a pyramid of their severed heads erected in honor of his victory. Of course, Genghis had been incensed by the Persians prior to the invasion. A few years earlier, he had tried to establish trade relations; but rather than being received with open arms, his emissaries were abused. In fact, with one group of three envoys, only two returned alive, along with the severed head of the third. It has been reported that Genghis had as much as 75% of the Iranian population massacred during his conquest, and, for the provincial governor who initially rebuffed his envoys, Genghis had him executed by pouring molten silver into his ears and eyes. Although he died in 1227, the cause is unknown. Some accounts say that he died when he fell off his horse, and others that he was killed by an unknown respiratory illness. One salacious, and probably false, account has it that a Tangut princess, captured in battle and added to Genghis’ harem, caused his ultimate death by castrating him. However he shed his mortal coil, the precise whereabouts of his remains are unknown. It is believed he was buried somewhere in Mongolia, but there are no contemporaneous accounts of his interment. Supposedly, in order to ensure that his afterlife would be peaceful and his resting place undisturbed, Genghis had ordered that its location remain a complete secret. So, possibly legend, possibly not, as the funeral procession traveled to the gravesite, the accompanying soldiers, all 800 of them, slaughtered everyone they encountered along the way. Then, after the funeral, all 2000 of the invited guests were slain, along with 40 sacrificial virgins and 40 horses. Finally, the soldiers supposedly killed each other and themselves. Genghis had only one official wife whose children could inherit. He also had five other morganatic wives and, presumably, a horde of concubines. Having an enormous . . . harem, Genghis must have had a lot of children. According to an international study of male DNA, nearly .5% of men, worldwide, carry his DNA. According to contemporaneous reports, by 1260, there were more than 20,000 members, by blood, of his family. His oldest son was reputed to have had 40 sons (girls didn’t count, apparently), and his grandson, the famed Kubilai Khan, was believed to have acquired around 30 new virgins, each year, to add to his harem. Genghis’ grandson, Kubilai Khan, consolidated the Mongol empire, again, in 1264 and founded the Yuan Dynasty, ruling China, Korea and Mongolia in 1267. He was visited by Marco Polo at his then-capital at Xanadu. Polo’s account of its magnificence inspired Samuel Taylor Coleridge to pen, after waking from an opium bender, the great, unfinished poem, Kubla Khan. The founder of the Timurid Empire in the late 14th century, Tamerlane claimed to be the heir to Genghis Khan. During his reign, he defeated the Mamluks in Egypt, Crusaders in Turkey, the Ottoman Empire and the Sultanate of Delhi. He is remembered for his military genius and is reported to have used spies and spread propaganda and disinformation prior to and during his military campaigns. Genghis is also known for having created the famous Yam courier system. Like an armed pony express along and around the Silk Road, under Genghis and his son, the Yam route allowed information and trade to move freely and safely throughout the empire. A series of stations supported the soldiers who manned the 5000 mile route, and they, in turn, provided security to the European and Asian traders who exchanged silk, spices, gold and silver, as well as people and culture. The title “Dalai Lama” was first given to the third Dalai Lama, Sonam Gyatso, by Altan Khan. In order to help secure his rule in Mongolia, Altan Khan invited and later agreed to let Sonam Gyatso convert Mongolia to Buddhism. Gyatso then proclaimed that Altan Khan was in fact the reincarnated of the great Khublai Khan, former ruler of China and Mongolia and grandson of Ghengis Khan, thus helping legitimize Altan Khan’s rule. The title “Dalai Lama”, literally means “The Ocean Lama”. The “lama” part comes from the Tibetan “blama”, which means “chief” or “high priest”. The “Dalai” part comes from Mongolian for “Gyatso”. Essentially, the Dalai Lama is an “ocean of compassion/wisdom”. The fourth Dalai Lama, Yonten Gyatso, the only to be born outside of Tibet to date, was the great grandson of Altan Khan. Genghis Khan’s DNA is Haplogroup C-M217, a type found throughout Asia and western North America, and more highly concentrated in indigenous Mongolians, Siberians and Kazakhs. Among these groups, red hair and green or blue eyes are common, and Genghis was no exception; presumably, these characteristics come from a small amount of female European genes in the group’s DNA. It has been reported that modern Mongolians have between 7 and 19 percent Caucasian DNA.